So after a Legislative Session that boosted mental health funding and saw the passage of important new laws and programs, how do two issues continue to make the front pages? Turns out that advocacy for mental health services isn’t confined to any legislative calendar. In this episode, we will look at the issues around recent Medicaid rate reduction for children’s therapy and new hearings focusing on jail suicide prevention that continue to generate headlines. Now you may be asking: What is this all about? And why wasn’t this handled during the Legislative Session? As written, they’ll slash by 25 to 90 percent what Texas pays for medically necessary physical, occupational and speech therapy through the Texas Medicaid Acute Care Therapy Program, which serves about 440,000 poor people with severe disabilities each year, most of them children. Advocates say at least 7,500 therapists will lose their jobs and 60,000 children will lose access to medical care because of the cuts. HHSC can’t refute these claims because it conducted no research in potential impact before announcing the new rates on July 8th. Why would our Health & Human Services Commission decide to cut the reimbursement to acute care therapies for children with disabilities without doing the proper research on insuring access to services were maintained? As of August 20th, half a dozen Republicans had sent letters of concern to HHSC Commissioner Chris Traylor, asking him to hold off on implementing those changes until the probable effects could be assessed. Joe Straus, the Speaker of the House, said the same in a Facebook post on September 10: “I expect the Commission to keep us in compliance with federal law as it works through a new proposal. I also believe it is the agency’s responsibility to inform the Legislature if the proposed reductions would harm access to care and network adequacy.” And last week, Robert Garrett, of the Dallas Morning News, reported that Representative John Otto and Senator Jane Nelson–the chairs of House Appropriations and Senate Finance committees respectively—have sent their own letters to Traylor, insisting that the cuts be implemented only if access to care is preserved, and if the state remains on the right side of federal law. On April 22, for example representatives Sylvester Turner, a Democrat, and Bryan Hughes, a Republican, spoke at a rally at the Capitol, where they warned that the Senate’s proposed budget would necessitate severe cuts to Medicaid therapy services. 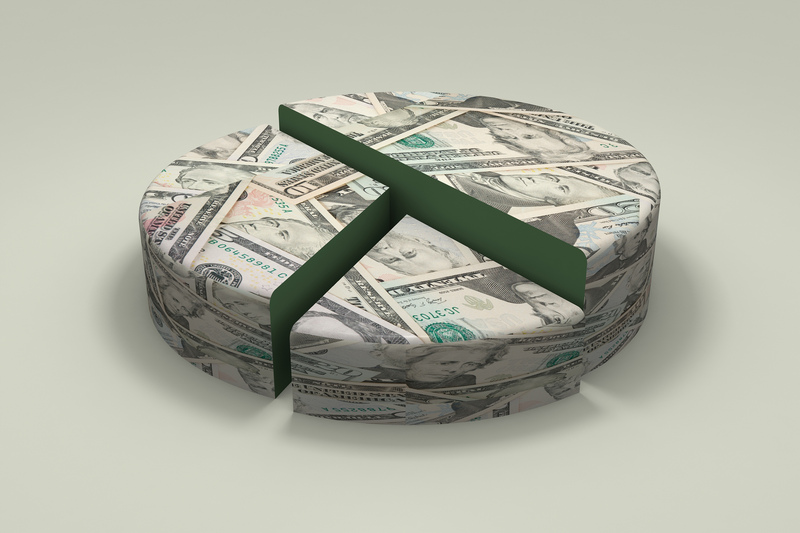 When the conference committee budget came back to the House floor for final passage, John Zerwas and Dan Huberty, both Republicans, flagged concerns about the cuts now in question. This is a pretty sloppy way to run a major state, clearly. Still, we shouldn’t make poor disabled children pay the price for political exigency. HHSC should hold off on implementing the cuts as planned. So we’ve heard from the Legislative leaders, but we haven’t heard much from the Governor’s Office. And with that silence came increased attention. After all, HHSC is an executive agency, so it would be natural for the Governor’s office to communicate with HHSC on implementation of the rider. 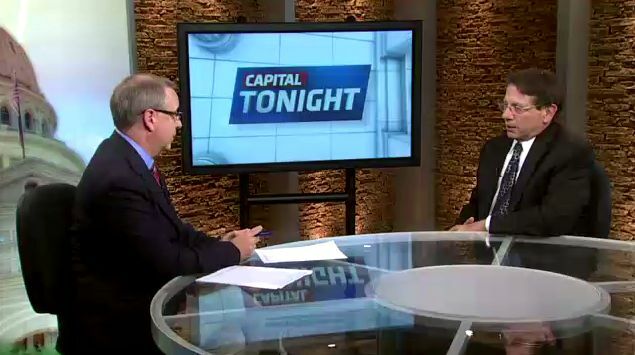 Capitol Tonight: Harvey Kronberg with the Quorum Report goes on the agenda with us tonight and you know this Medicaid cut story of course is still with us. The governor publically made a comment on Friday during that emotional hearing that took place here in Austin. What did he have to say? Harvey Kronberg: He simply said that they were working out legislative intent which was due to the Medicaid funding cuts. Of course the second half of legislative intent was to do no harm and the cuts that they are proposing do extraordinary harm. CT: And in the mean time I know you posted your thoughts about a request for information from the governor’s office regarding all of this. What were you after and what was the response? Kronberg: Well, the governor’s office has been amazingly nonresponsive on this really fairly significant issue, one that has gotten the legislature reengaged by being essentially appalled by the fact that they are going to do 90% cuts to providers for severely disabled children. So we have not been able to get a comment out of the governor’s office so we simply did an open records request to seek the communication between the governor’s office and the Department of Health and Human Services to see if they were trying to solve the problem or were they part of the problem. They did an extraordinary thing, something that I have never seen in almost three decades of doing this: they invoked the entire Public Information Act and said they were not going to respond and turned it over to the Attorney General’s Office. Now, anybody that reads the Public Information Act will see that includes things about exemptions for sexual offenders, for automobile accidents. Typically when someone uses the Public Information Act not to respond they cite what the clauses are that they used. CT: And you point out about what was said during the campaign. Kronberg: It’s still on his website unless he’s taken it down that he’s going to be the ‘Transparency Governor’ and this is anything but transparent. And it’s not unreasonable to conclude that if they are trying to hide their emails that they are actually not trying to solve the problem. The legislative budget board has a lot of discretion in being able to move funds around and enact legislative intent. It’s perfectly capable of resolving this problem if it has got gubernatorial support and legislative support. At least the House seems to be resolved and certainly the Senate finance chair seems to have come around so I’m not sure why the governor is being so mysterious and guarded in terms of his office’s communication with Health and Human Services. “Procedurally I’m not making a determination that these acts are valid or invalid,” said State District Judge Tim Sulak in his announcement that he would grant a temporary injunction to prevent the state from slashing payments to therapists. But he said he made his ruling in part because he’d been convinced the cuts could jeopardize the health of children receiving the therapy services. The health commission says it’s just following the Legislature’s orders by implementing the cuts, and that opponents’ claims providers will stop treating disabled children are exaggerated. In closing arguments, Eugene Clayborn, a lawyer representing the state, said there was “no evidence” of critics’ arguments that “the sky’s going to fall in” because of the cuts. “There will still be access to care,” he said. The lawyers suing the state focused much of their argument on trying to disprove that point. Owners of home health agencies in North and Central Texas testified that their businesses would be forced to close, including in markets where they are the main provider of therapy care. And they presented evidence from inside the health commission that shed light on the agency’s discussions around access to care. One director at the health commission testified that state employees had been told never to say that they were certain the cuts would not jeopardize access to care. So for now, it seems that the Texas Medicaid Acute Care Therapy Program will not see the dramatic rate cut, at least until the state appeals this decisions. 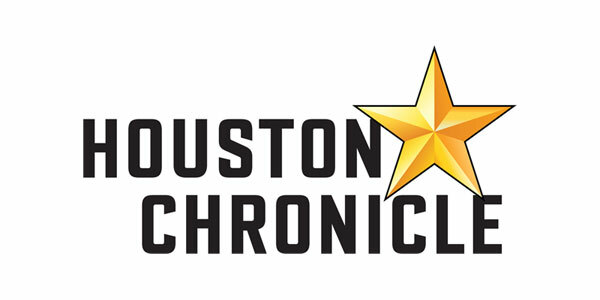 Stay tuned to Minding Houston as this public policy drama continues to play out. Next, we move to another issue making headlines: jail suicides. After the legislative session ended, two committees have taken up this issue in interim hearings: The House County Affairs Committee, chaired by our friend and Houston, and the Senate Committee on Criminal Justice chaired by Houston’s own Senator John Whitmire. The announced ramp-up of anti-suicide measures came as Brandon Wood, executive director of the Texas Commission on Jail Standards, which monitors jail conditions, told the House committee that half of the record 29 people who have committed suicide in Texas county jails this year told jailers they were suicidal when they arrived at the lockups. The increased number of jail suicides this year – compared to 22 in 2014, 25 in 2013, and 23 in 2012 – has become the focus of several ongoing investigations and legislative inquiries, spurred, in part, by the July 13 death of community activist Sandra Bland in the Waller County Jail. Despite general support from sheriffs to stop suicides, some counties already have expressed concerns about the additional costs the changes could bring in areas of Texas where jail budgets are small and taxpayers cannot pay for expensive new programs. In years past, several plans by state officials to impose tougher rules on county and local jails have been scuttled by opposition from local officials who oppose unfunded state mandates on their jail operations and who wield considerable clout with local legislators. Wood said the new intake screening form is designed to help jailers better identify potentially suicidal inmates. Previous screening forms asked jailers whether they suspected an inmate was suffering from mental illness. The new form removes that subjective element, officials said; if inmates give certain answers, jailers are required to notify their supervisors and contact local mental health authorities. The form also uses a grading system to serve as an additional guide to jailers on when to contact mental health professionals even if an inmate’s answers would not immediately initiate a referral. A draft of the new form can be found below. Mr. Wood promised to continue to work with the committee on how they could immediately change both the form and procedures during the interim. Bill Kelly: I’m with the Dean of the Texas Senate, Senator John Whitmire, chair of the Senate Criminal Justice Committee. Senator, thank you so much for taking time to meet with us today. So Senator, we were at Representative Coleman’s hearing and you heard a lot about jail intake forms. And a lot of this has been made about moving away from subjective questions on there to more of a standard operating procedure. What do you think about the changes to intake forms and are there any other immediate fixes we can do to address jail suicides? Sen. John Whitmire: Well, I think reviewing the forms is proper and in fact today in our hearing we will hear about the new forms and they are going to be much more comprehensive at intake. But I’m quickly pointing out that you can redo all the forms you want, but if the person doing the screening is not trained, if the person doing the screening does not have the right compassion and attitude, doesn’t work for the right person, you can have all the new forms you want and we will still have a difficult situation. Because I think it gets down to attitude, you want to treat people in intake like you would like to be treated or one of your family members and that’s just not the case today particularly as they review any concerns for mental health or emotionally disturbed individuals. You can see it, you can question it, fill out the forms, but if you do not respond properly we will still have a person in danger. Kelly: And Senator you have been a longtime critic of the budget cuts, particularly in 2003, to mental health services and other state services and now we have seen some of the biggest advocates for mental health services be our law enforcement community. Has their advocacy changed some of the minds of your peers when it comes to funding mental health services? Whitmire: It’s impacting the legislature and, to some degree, local governments who often times have to pay for the jail. The problem is that it’s too slow. Obviously you know me well, I’m an impatient person. We have identified a problem and we haven’t attacked it to the degree that it needs to be. Law enforcement is recognizing and talking about it more because its impacting their criminal justice system. It’s using up valuable resources for largely non-violent low-level offenders who are mental health patients so it’s beginning to interfere with law enforcement’s main mission of going after dangerous criminals. It’s kind of a culmination of “let’s be tough on crime but we can’t do that if we’ve got these nonviolent folks.” I’m encouraged that we are having a grown up discussion, but we’ve got a hell of a long way to go. Kelly: Senator, last question. I know the push to address a lot of this jail suicide issue has been very bipartisan. When it comes down to really making a difference a lot of times it’s going to take funding. Do you feel confident whether its increased money for training for jailers, whether its increased inspection money for the Texas Commission on Jail Standards do you have faith that your Republican colleagues will stand with you for allocating funding? Whitmire: There’s been indication in recent sessions. Joan Huffman and a Senator from Houston helped fund a pilot diversion program for mental health for individuals in Harris county jail. That was a good start but still we’ve got to do a lot more. My colleagues are very fiscal conservative and what I’ve got to convince them is that you either pay now or you pay later. You either pay upfront with treatment and counseling and medication and diversion programs and alternatives to incarceration or you are going to pay later not only in dollars but you could be a victim and certainly we will have compromised the life of the individual who needed the treatment. We got a lot of work to do. I hate to put a cost factor on doing the right thing, but I do work in an environment – the Capitol – where it’s not uncommon to leave money unspent so they can say that they are fiscal conservatives. I made a commitment to the mental health community ten years ago when I recognized that they didn’t really have a lobby. They didn’t have someone in your position as we do today. We have got to get people, as I have committed. I won’t give a speech about anything dealing with criminal justice without mentioning mental health because they don’t have a paid lobby; they have an organization such as yourself, but they don’t have the lineup that big business and big labor has. The only lobby that they are going to have are the legislators that care and the people of Texas and so our work is cut out for us. Kelly: Absolutely. Senator, thank you so much and best of luck in the hearing today. 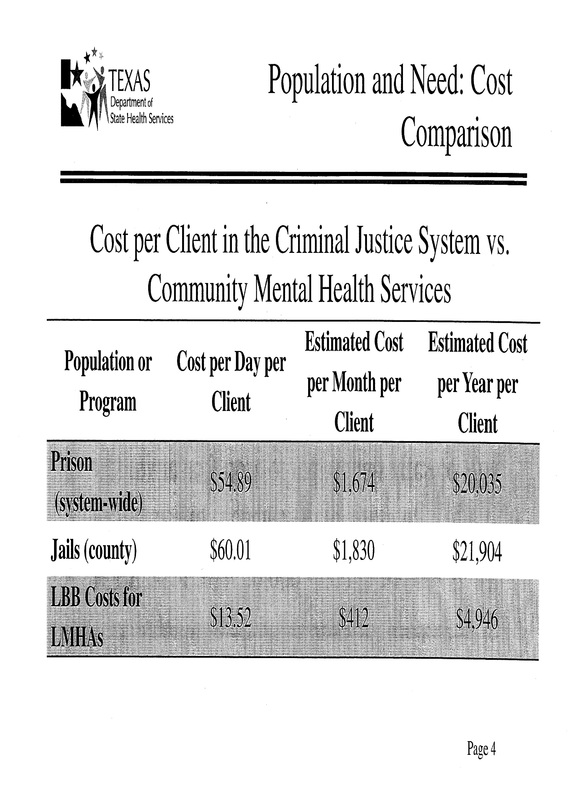 Now, with those numbers in mind, check out this slide for the cost the criminal justice system bears in housing and treating individuals suffering from a mental illness. From these numbers, it is clear that the provision of mental healthcare on the front end is ¼ the cost of prisons and jails per day, with a yearly savings of $15,000 per individual. For the 20,000 people in Texas County jails with a serious mental illness, if we were able to divert just half into treatment, it would save the state $150 million a year. We hope the Senator will let his colleagues know, even in Texas, that’s a LOT of money. Diversion, the overwhelmingly preferred treatment for low-level offenders with mental health problems would work best with coordination among mental health authorities, law enforcement, jails and courts, lawmakers said. If an inmate has a mental health problem, all those entities should work together to move them into treatment as soon as possible, Whitmire said, adding that it shouldn’t be an issue in rural areas where officials likely know each other well and can use that as a benefit to help with seeking treatment. Ultimately, Whitmire said, the state has a responsibility to address this issue because if it denies someone their freedom, there are constitutional responsibilities involved in caring for people in custody. Sen. Charles Perry, R–Lubbock, injected caution throughout the hearing, warning that the state risks having a knee-jerk reaction to high-profile cases such as Bland’s and not seeing that protocol is not the enemy. He asked Wood what ultimately led to Bland’s death. “People not following through, first and foremost,” Wood said. 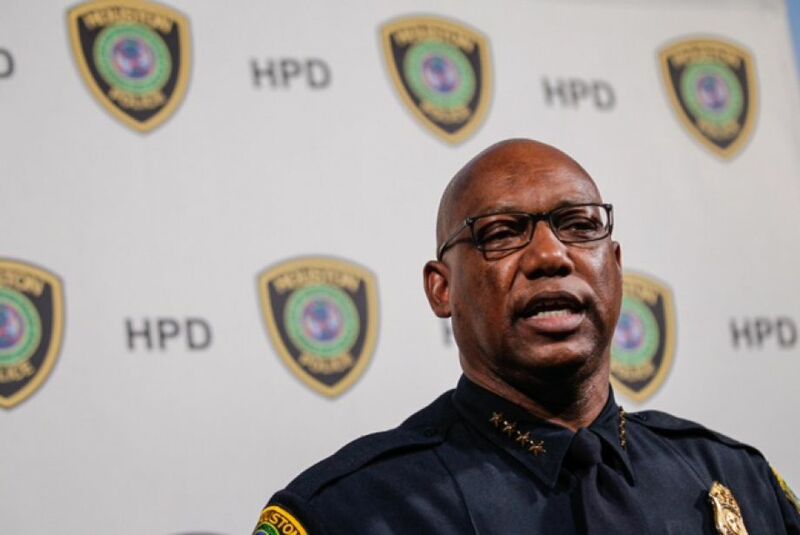 Houston Police Chief Charles McClelland detailed how his agency has implemented a program to do just that in the city jail, which, as a municipal lockup, is not regulated by the state. Whitmire and other lawmakers have suggested that municipal jails should be regulated by the state, like Texas’ 242 county jails. 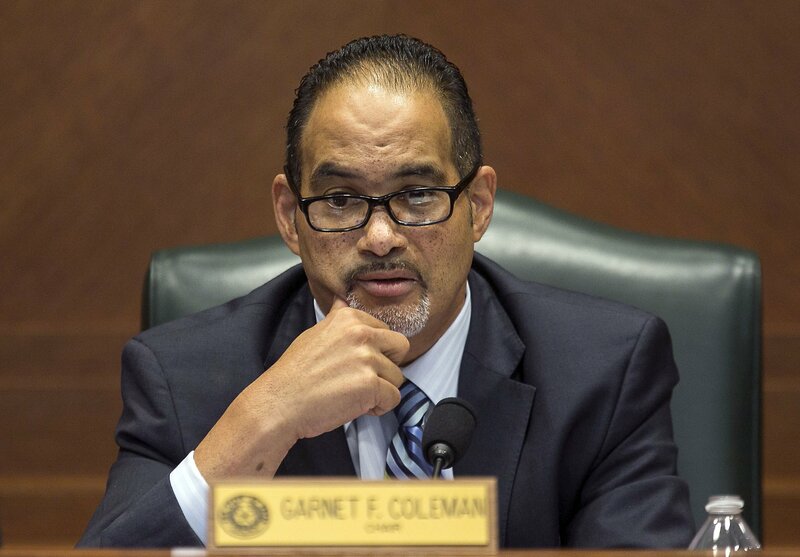 McClelland said the Houston jail that handles about 75,000 low-level offenders annually has had only two suicides in recent years, including this year, and has beefed up mental health screenings, supervision and interventions. Chief McClelland testified about the fabulous work done by the Mental Health Division of the Houston Police Department. From the Homeless Outreach Team to the Chronic Consumer Stabilization Initiative, McClelland was very proud of the work done but emphasized the training that new HPD cadets receive as part of the academy. As we’ve mentioned, Houston is recognized by the Department of Justice for having one of six national training sites for Crisis Intervention Training (or CIT) in the country. As Senator Whitmire has said, your programs are only as good as the people implementing them. In Houston, we are lucky to have some of the best. Now, neither of these two issues will be solved any time soon. But they will need people to advocate for them: for their importance on the agenda and in the budget. That’s exactly what we hope to do in the lead up to the 85th Legislative Session in 2017. For now, this is Minding Houston.